Fits all specified vehicles with column shift automatic transmission. Must modify stock exhaust to retain catalytic converters. Not legal for use on pollution controlled motor vehicles. Applications with oxygen sensor use reducer 387-10110 for 3'' 3-bolt flange. Fits C30 Crew Cab only, will not fit Standard cab. Afterburner Headers Break New Ground! FlowTech's Afterburner Headers are the latest innovation in header technology! The patented Velocity Turbo Chamber gives you more HP and torque by smoothing out exhaust pulses which in turn increases scavenging, improving your exhaust systems efficiency! Perfect for most Small Block Chevy applications, the Afterburner Headers utilize a 1.625'' primary tube with a 3'' collector giving you the torque of a Tri-Y style header with the midrange and high end HP of large tube headers! Available in either high temperature black painted or metallic silver ceramic finish. 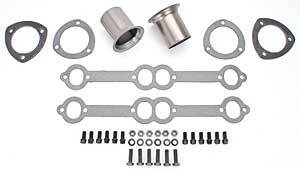 Includes all necessary gaskets, bolts, and reducers. NOTE: Will not fit with angle plug heads. Does Flowtech 49150 fit your vehicle? 49150 is rated 5.0 out of 5 by 1. Rated 5 out of 5 by Mcgeelan from Fit perfectly and look awesome! I'm fixing up my 1978 Chevy c10 and installed a 383 engine.. These headers fit perfectly and definitely get the job done.. Great price as well!